The five principles for instruction. 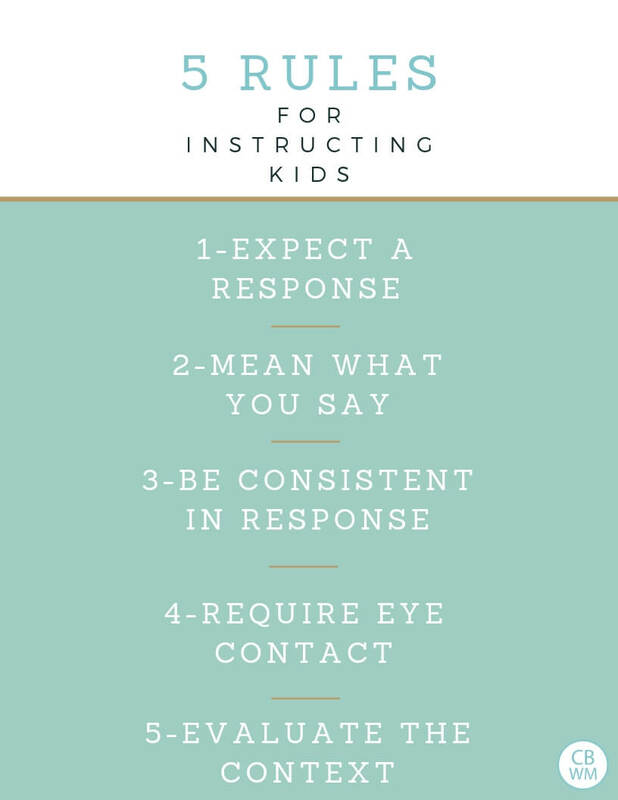 Five rules to follow when you give your child an instruction. Always keep these things in mind. 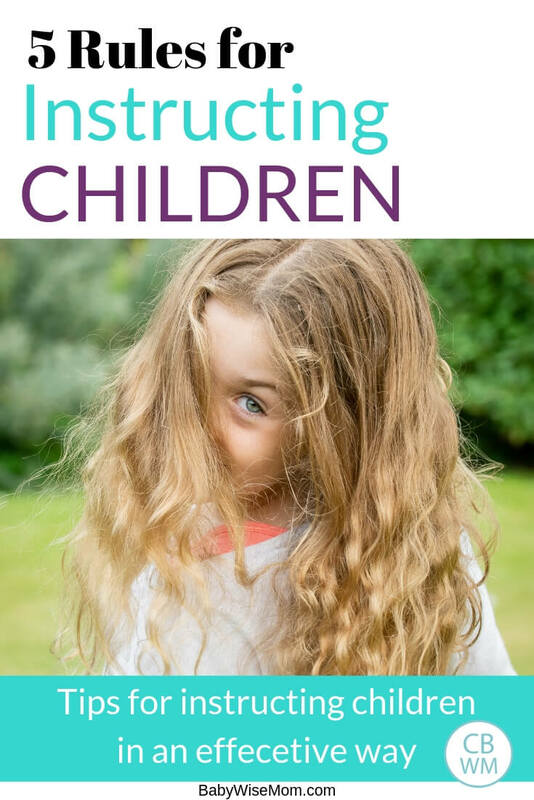 On Becoming Babywise II lists five principles to keep in mind when you are giving instruction to your child (pages 89-90). These principles apply with your baby and on up through your toddler and child years. Here are the five different principles and my thoughts on them. When you tell your child to do something, expect him to do it. When you ask your child a question, expect a response. Children rise to the expectations placed on them. You want to be sure your expectations are age appropriate. That means you neither expect too little nor too much. 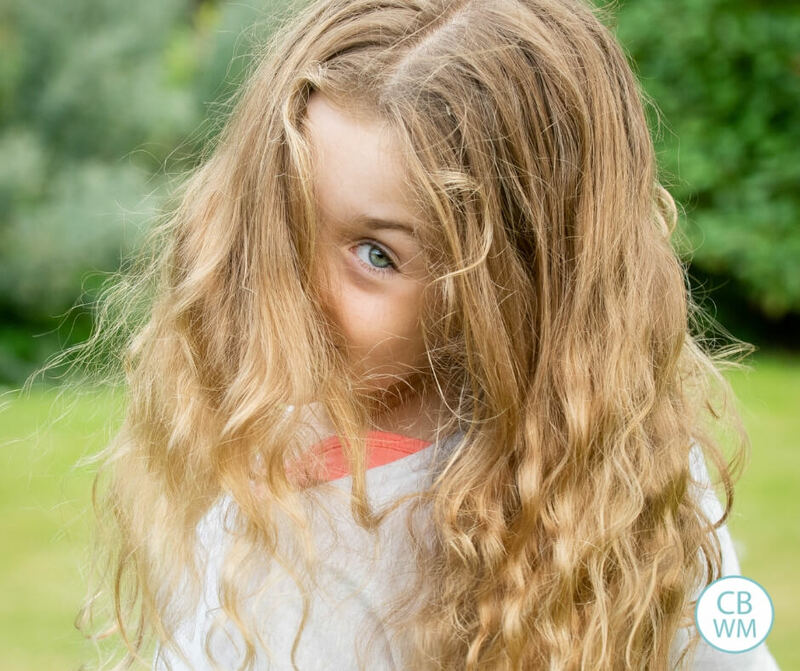 Read How to Get Your Child to Obey with a Simple “Yes Mom” for more on this. Don’t ever tell your child to do something if you aren’t going to follow through with making sure he does it. Don’t hope he will respond, but when he doesn’t think, “Oh well, maybe when he is older.” If you do this, he will learn to disregard your instruction. When you give instruction, be clear in what it is. Keep it at a level of understanding for your particular child. 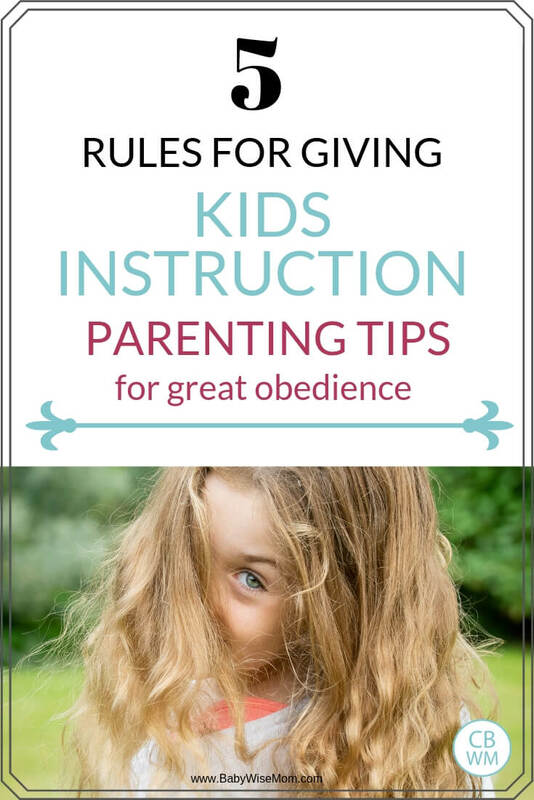 Once you have given the instruction, you need to be consistent in expecting your child to follow through and obey. If your child is doing something he shouldn’t and you know you have no intention of making sure he stops, it is better to say nothing than to tell him to stop and then let him continue on. When you give an instruction, require eye contact from your child before you give it. Babywise II says to start this at twelve months old. You can start by saying, “Look in my eyes” or I say, “Look at Mommy’s face” and turning the child’s chin so he is looking at your face. Before too long, he should understand what you mean and look without your turning his face for him. When your child is looking at your face, there are several benefits. One is that you know he is listening and aware that you are speaking to him. Another is that he isn’t getting distracted by the other things going on around him, so he can process your instruction. I want to add a cultural qualification here. For the U.S. culture, eye contact is an important non-verbal cue that the listener is actively engaged in what the speaker is saying. If you live in a culture where this is inappropriate, you don’t have to do it. I know that for many cultures, a child looking an adult in the eyes would be a sign of disrespect. If this is true for you, think of something you can instruct your child to do that is culturally appropriate that can demonstrate that the child is listening. Read up on the Basics of Discipline here. You need to always be mindful of the context of the situation. Otherwise, you run the risk of becoming legalistic. You can assume your child’s actions were wrong incorrectly. You can also assume your child’s actions were innocent when they were quite wrong. Few “rules” or actions are always right or always wrong. Here is a simple example. Let’s say you have instructed your child to not run. He is usually very good at obeying this instruction, but one day runs. You find out that he ran because there was a bee next to him. He was stung by a bee last week, so he knows he doesn’t want to be near it. In the context of this situation, your child wasn’t acting out of disobedience but rather self-preservation. You might be in a situation where running just isn’t safe. For example, you might be walking down the sidewalk with a busy street by you. Rather than punishing your child for running in this situation, you would want to talk to him about this and come up with a plan for him if he feels the need to run. These five principles can help you to have more successful training periods with your baby, toddler, and child. Following these five steps will help you be successful as a parent and get great obedience from your children!